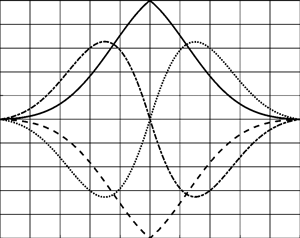 The problem of digital signal recognition has been considered in conditions of deforming distortions of the waveform of these signals and additive Gaussian noise. 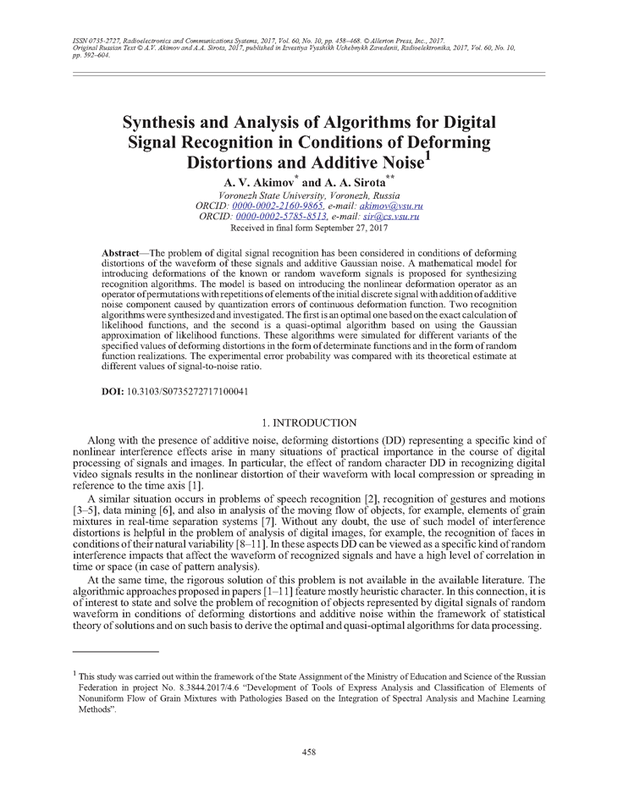 A mathematical model for introducing deformations of the known or random waveform signals is proposed for synthesizing recognition algorithms. The model is based on introducing the nonlinear deformation operator as an operator of permutations with repetitions of elements of the initial discrete signal with addition of additive noise component caused by quantization errors of continuous deformation function. Two recognition algorithms were synthesized and investigated. The first is an optimal one based on the exact calculation of likelihood functions, and the second is a quasi-optimal algorithm based on using the Gaussian approximation of likelihood functions. These algorithms were simulated for different variants of the specified values of deforming distortions in the form of determinate functions and in the form of random function realizations. The experimental error probability was compared with its theoretical estimate at different values of signal-to-noise ratio. AGHABOZORGI, S.; SHIRKHORSHIDI, A.S.; WAH, Teh Ying. Time-series clustering – A decade review. Information Systems, v.53, p.16-28, 2015. DOI: https://doi.org/10.1016/j.is.2015.04.007. RABINER, L.; JUANG, B.H. Fundamentals of Speech Recognition. Englewood Cliffs, NJ: Prentice Hall PTR, 1993. CORRADINI, A. Dynamic time warping for off-line recognition of a small gesture vocabulary. Proc. of IEEE ICCV Workshop on Recognition, Analysis, and Tracking of Faces and Gestures in Real-Time Systems, 13 Jul. 2001, Vancouver, BC, Canada. IEEE, 2001, p.82-89. DOI: https://doi.org/10.1109/RATFG.2001.938914. GAVRILA, D.M. ; DAVIS, L.S. Towards 3-D model-based tracking and recognition of human movement: a multi-view approach. IEEE Int. Workshop on Automatic Face- and Gesture Recognition. IEEE Computer Society, Zurich, 1995, p.272-277. DOI: https://doi.org/10.1.1.56.5329. RANACHER, P.; TZAVELLA, K. How to compare movement? A review of physical movement similarity measures in geographic information science and beyond. Cartography and Geographic Information Science, v.41, n.3, p.286-307, 2014. DOI: http://dx.doi.org/10.1080/15230406.2014.890071. KEOGH, E.; RATANAMAHATANA, C.A. Exact indexing of dynamic time warping. Knowl. Inf. Syst., v.7, n.3, p.358-386, 2005. DOI: https://doi.org/10.1007/s10115-004-0154-9. ALGAZINOV, E.K. ; DRYUCHENKO, M.A. ; MINAKOV, D.A. ; SIROTA, A.A.; SHUL’GIN, V.A. Hardware-software complex for the analysis of a nonuniform flow of objects in real-time optical sorting systems. Meas. Tech., v.57, n.5, p.509-518, 2014. DOI: https://doi.org/10.1007/s11018-014-0489-x. FELZENSWALB, P.; MCALLESTER, D.; RAMANAN, D. A discriminatively trained, multiscale, deformable part model. Proc. of IEEE Conf. on Computer Vision and Pattern Recognition, 23-28 Jun, 2008, Anchorage, AK, USA. IEEE, 2008, p.1-8. DOI: https://doi.org/10.1109/CVPR.2008.4587597. ZHU, X.; RAMANAN, D. Face detection, pose estimation and landmark localization in the wild. Proc. of IEEE Conf. on Computer Vision and Pattern Recognition, 16-21 June 2012, Providence, RI, USA. IEEE, 2012, p.2879-2886. DOI: https://doi.org/10.1109/CVPR.2012.6248014. KEYSERS, D.; DESELAERS, T.; GOLLAN, C.; NEY, H. Deformation models for image recognition. IEEE Trans. Pattern Analysis Machine Intelligence, v.29, n.8, p.1422-1435, 2007. DOI: https://doi.org/10.1109/TPAMI.2007.1153. AKIMOV, A.V. ; SIROTA, A.A. Synthetic data generation models and algorithms for training image recognition algorithms using the Viola-Jones framework. Computer Optics, v.40, n.6, p.911-918, 2016. DOI: http://dx.doi.org/10.18287/2412-6179-2016-40-6-911-918. FUKUNAGA, K. Introduction to Statistical Pattern Recognition. San Diego, CA: Academic Press, 1990. SIROTA, A.A. Methods and Algorithms for Data Analysis and Their Simulation in MATLAB Environment [in Russian]. St. Petersburg: BKhV-Peterburg, 2016. GONOROVSKII, I.S. Radiotechnical Circuits and Signals: Textbook for Institutes of Higher Education [in Russian], 4th ed. Moscow: Radio i Svyaz’, 1986. WIDROW, B.; KOLLAR, I. Quantization Noise: Roundoff Error in Digital Computation, Signal Processing, Control, and Communications. Cambridge: Cambridge University Press, 2008.